Wizard had a visit from the farrier on Thursday. He remarked that Wizard was far more flexible in his hind end than he was the last few times. This makes me think that the chiropractic appointment last week had more benefits than just the ones I felt under saddle. I rode Wizard in the dressage court outdoors, again with our stripped-down bridle and also an ear net to keep the flies away from Wizard’s delicate noggin. Forward and sideways were the name of the game. We worked on leg yirlding at the walk and the trot in both directions. In order the keep his impulsion up, I also sprinkled in some big-trot-little-trot exercises. We were able to leg yield with the correct amount of bend from the center line in both directions. I’ve never tried that before- we usually use the quarter line as our marker. He was great! And he was also greatly improved at his transitions within the gaits, moving smoothly into a very big walk from a regular walk and also a great forward trot from his working trot. 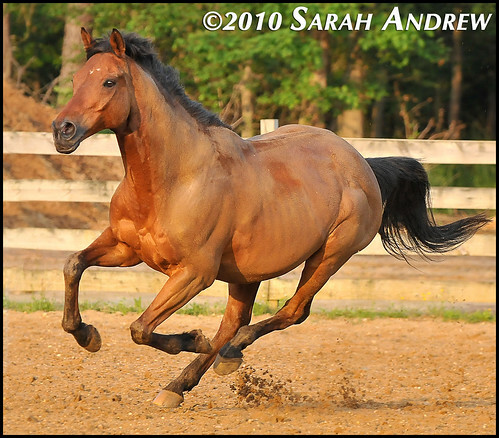 I used to do a lot of forward trot work with Alibar and I think it has a world of benefits for a horse.